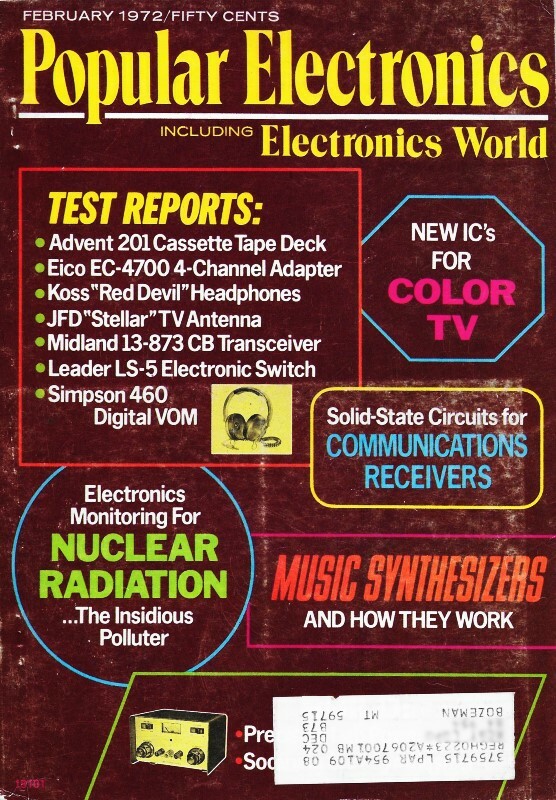 According to this 1972 article in Popular Electronics, there were as many as 50,000 computers in the world at the time using magnetic core memories. Among them was the Apollo Guidance Computer that was onboard the Apollo 11 Lunar Module that Neil Armstrong used in July 1969 to land on the moon*. Semiconductor memories were being manufactured in 1972, but believe it or not they were not as fast as the magnetic core memories. Machinery was not available with enough precision and repeatability to thread the read, write, sense, and (sometimes) inhibit wires through each ferrite core. The TPX-42** IFF (Identification Friend or Foe) secondary radar I worked on in the USAF had a 1 kByte magnetic core memory. 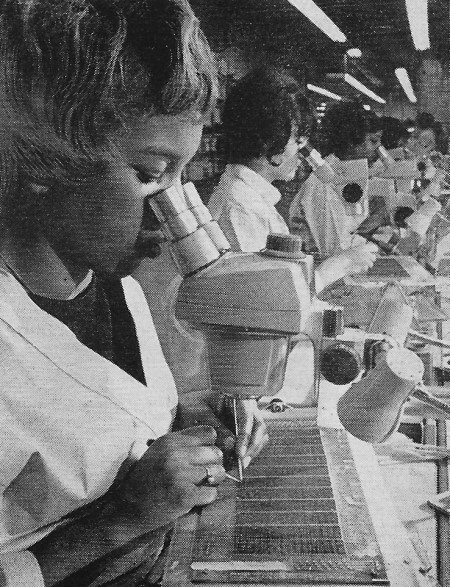 Small women with small hands were the most adept at doing the job of manual assembly. I'm guessing there were no coffee breaks for those dedicated women. Valium breaks were more likely. * The Apollo 11 Lunar Module was ejected after Armstrong and Aldrin re-entered the Command Module. It crashed somewhere on the moon's surface. ** See bottom of page. Aided by powerful microscopes, skilled women weave hair-like wires and tiny ferrite cores into a computer memory. It is an ironic fact that one of the most critical and costly parts of modern computers is produced by handwork more exacting than the finest embroidery. 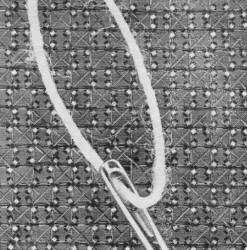 This is the core memory, the portion of the computer that stores information for high-speed electronic calculation - and transfers it at speeds measured in billionths of seconds. The performance of this central memory, more than any other part, determines how efficiently a computer can do its job. In fact, a core memory may account for more than half the cost of a large high-speed computer. The cores are tiny rings of an iron oxide material, some less than a fiftieth of an inch in diameter. Each core may be magnetized in a clockwise or counterclockwise direction to store a unit (bit or binary digit) of computer information. Women's deft hands string these tiny beads together with hair-like wires. Up to three wires may be run through the almost invisible center of the core. The wires carry electric current that reads, writes, or erases the information in each individual core. As many as ten million cores may be contained in a single memory. For years, computer designers have sought ways to automate the production of high-speed memories and eliminate this handwork. Various methods have been tried at great expense, but none has yet emerged that can equal the combination of speed, economy and reliability that hand-wired cores achieve. 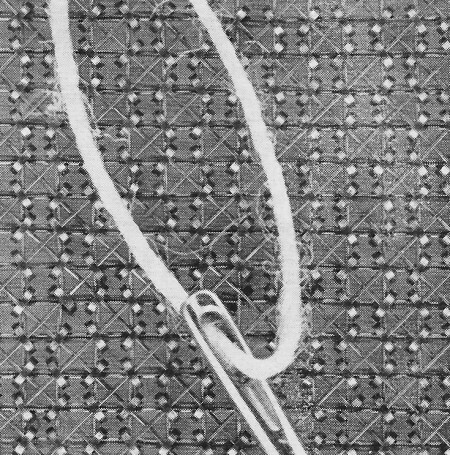 Common #7 needle and 00 thread dwarf cores and wires in typical section of Ampex computer memory. Each core stores unit of computer data. Three wires go through center of each core. Semiconductor memories with higher operating speeds are beginning to be used in some of the newer computers. Such memories have shown up to three times the speed of core memories, though they have yet to equal their economy. But the core will continue its vital role for many years to come. Further increases in core speed, economy and compactness are certain. Besides there are more than 50,000 computers in use in the world today that rely on core memories. Since these computers have been designed with cores, it would require radical and expensive changes in the computer itself to replace existing core memories with semiconductors.